Database Fanedit Listings FanFix Doc SalvageD, The Fan-edit of Bronze! Doc SalvageD, The Fan-edit of Bronze! This is intended to give George Pal the swan song he deserved and to save a true classic from the menace of the filming industry. During the last decade-and-a-half of his life, George Pal couldn’t get sneezed on in Hollywood. During this period, he got a grand total of TWO of his many creative projects green-lighted: the under-rated and poorly-sold THE POWER in 1968, and DOC SAVAGE: THE MAN OF BRONZE in 1975. It is especially ironic that he should not have been more celebrated during the science fiction boom of the late-1970s brought on by the success of STAR WARS and CLOSE ENCOUNTERS OF THE THIRD KIND as those films (and the run-up to them) bore such an indebtedness to Pal and his work. 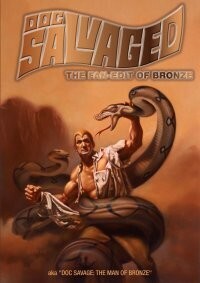 Fans of the Doc Savage pulp novels and fans of George Pal’s films were equally disappointed with DOC SAVAGE: THE MAN OF BRONZE. Yet, many recognized that beneath the campiness, the germ of a decent film existed. A group calling itself “The Save Savage Society” sprang up not long after the film’s original release. They circulated petitions in hopes of raising enough interest to spur Warner to recut, rescore and re-release the film – but again, to no avail. Warner Home Video released DOC SAVAGE: THE MAN OF BRONZE as a fullscreen (“open matte”) videocassette in 1986 (large plastic case), then released it again (cardboard slipcase) in 1991. The hard-to-find LaserDisc (it seems that only a small number were pressed), released in 1998, was matted to its original theatrical 1.85:1 aspect ratio. The film’s only (legitimate) DVD release thus far was in Germany in 2005 (again, open-matted fullscreen). The genesis of this project was in late June of ’06 when “The Doc” (henceforth, “TD”) secured a DVD capture of the LaserDisc version of the film. Inspired by finally having a superior copy to watch, he began to think about a version he’d downloaded from Usenet, wherein some like-minded individual had replaced ‘The Doc Savage March’ with a straight (non-vocal) version of Sousa’s “Thunderer March”. The philosophy of this project is much in accordance with the universal and not-so-secret wishes of Doc fans since 1975: to coax this film into a more faithful straddling of the line that Mr. Price defines so well. To that end, some of the changes entertained by the “Save Savage Society” and others have been effected – “the music, the twinkle… the fight labels, the crib” – while others have not. With the “Doc Savage March” vocals removed from the front end of the film, the voiceover seems less innocuous (especially with the Long Tom “short circuit” excised). Likewise, the “Green Death” was left intact: in 1975, it was not too far from the “state-of-the-art”. (All very academic as it would leave a vacuum were it removed.) Arbitrary dialogue and action that made characters seem silly or downright stupid has been cut. Audio and video for this project were taken from the 2005 German DVD. In retrospect, a LaserDisc capture might have made better source material as the 1998 LD transfer was done with MUCH more care: reel change markers were not cleaned up on this DVD, the print is dirty, it seems to suffer sprocket-hole damage in spots (‘Johnny’ leading into ‘Long Tom’ in Chapter 3, and elsewhere), and is generally little clearer than the LaserDisc. VirtualDubMod (with many ‘vdf’ and AVISynth filters) and the HuffyUV codec were used for frame-accurate video editing and subsequent conversion to NTSC-film format. Audio editing was done using Sonic Foundry’s Sound Forge. TMPGEnc was used to convert the 27 video chapter AVIs to 6000kbps VBR MPEG, and BeSweet converted the audio WAVs to AC3. Closed captions were extracted from the LaserDisc capture DVD-R and reworked into subtitles using Subtitle Workshop and a number of other tools. The timing of these subtitles is not always perfect, but they’re there. This film is a faily well-composed “open matte”. Though intended for presentation in a matted 1.85:1 aspect ratio, it suffers from few of the bugaboos of open matte productions: visible boom microphones, incomplete sets, partial matte paintings, etc. Viewers with 4:3 displays will not find it distracting to watch this DVD “fullscreen”. Nonetheless, an experiment was attempted on this project to see if a subtitle stream could be used to “soft matte” an open-matted film for selectable-letterbox presentation on a 4:3 display. As the result was only partially successful (it works on some DVD players but not on others), a menu was not provided to highlight this “feature”. Also, as this film is “open-matted”, viewers with 16:9 displays are advised to use the “Crop to 16:9″ feature of your television or DVD player for best results. Got rid of the cheesy red, white and blue “USA” in John Philip Sousa’s name in the opening credits. Got rid of the animated “twinkles” in Doc’s eye. Removed all visual references to Don Rubio sleeping in a big crib(!) (and ‘Rock-a-bye Baby’ musical cues). The chapters and chapter titles for this film were gleaned from the LaserDisc release of the film. The first and most important change in this chapter is the replacement of the “Doc Savage March” with the “no vocals” version from “The Fantasy Film Music of George Pal”. The first of three “twinkles” in Doc’s eye has been removed. In the first two versions of this re-edit, the offending frames (6 frames for each “twinkle”, BTW) were exported to a series of BMPs and an un-twinkling eye was cut and pasted (from a “clean” frame) into each. However, without the twinkle, the close-up is superfluous, so it has been removed in favor of an extension of the medium shot to compensate. A dissolve was added in place of the jump cut from Doc to a snowy horizon which left the viewer with a lingering “after image”; this change also diminishes the obviousness of the backward footage used to accomplish the aforementioned medium shot extension. Also, with the twinkle gone, the corresponding triangle strike in the music seemed unnecessary, so it was removed. The “Fortress of Solitude” banner over the doorway of Doc’s igloo has been cropped out. The shot of the rocket was shortened to skip the silly “fish” thing. Long Tom’s “short circuit” was removed. To make up (somewhat) for the abruptness of the resulting cut, reverse footage was used. Doc’s minor stumble while rising from the lotus position has been edited out. Throughout this chapter and the next two, much effort was made to minimize the fact that the actor portraying the South American Indian assassin is all-too-obviously a blue-eyed Caucasian. His close-ups were eliminated, but some medium shots were problematic to remove so they remain. Removed Renny’s “Hi Doc” line (for cleaner intercutting). Removed Doc’s “I picked up your thought waves…” line. Removed the assassin turning to fire on Doc, Doc’s subsequent duck into the stairwell, and Doc shooting his pistol at the assassin. This was done for cleaner intercutting, NOT to eliminate the one instance in the film of Doc using a gun! Removed Monk’s “We know that sound by now” line. Also removed the word “buddies” from Monk’s line about fighting together in the trenches. Removed Borden’s “rest in pieces” toast and everything from Captain Seas’ “I started out in a sideshow…” line to the end of the chapter. Dissolved the end of this chapter into the beginning of the next. Cut Don Rubio answering and talking on the phone for use in the next chapter. The cook drooling over Doc (after swatting the two young maids for doing the same) has been eliminated. Removed Monk’s hiccup reaction after Seas’ informing the men that the meal was their last. Removed the first of several musical references to “La Cucaracha” (hackneyed if not completely inappropriate). Removed Doc’s second “eye twinkle”, using the cut and paste method described under Chapter 2. Removed two shots containing Don Rubio’s giant crib. Removed “hungry as an ape” exchange between Ham and Monk. Also removed Doc whistling “La Cucaracha”. Left intact the singing of “La Cucaracha” in the car: it is less conspicuous in this context and trying to remove it would cause a problem with Mona indicating their approach to her village. Removed Ham and Monk interacting with the girl in Mona’s village. The second of three “Doc Savage March” cues were removed from this chapter. To do so, it was necessary to re-edit (and significantly shorten) the trek to the ‘Edge of the World’ to fit the available non-vocal musical segment. Removed Captain Seas’ “law of the jungle” line. Removed Monk’s exchange with Chief Chaac. Re-edited so the Fabulous Five untying their hands seems like less of an afterthought. Monk’s “Have No Fear, Doc Savage is Here!” (perhaps a bit too energetic for a guy with the life sapping out of him) has been replaced with a quieter acknowledgement of Doc’s arrival. Removed hard subs indicating fighting sytles. Replaced more musical references to “La Cucaracha” (with mixed results). Removed Doc’s third (and last) “eye twinkle”, again using the cut and paste method described under Chapter 2. Removed medium shot of Don Rubio covered in gold. Replaced the last of the three “Doc Savage March” cues (again, replacing it with the available non-vocal musical segment). For the balance of the credits, a section of the “Doc and the Girl” track (from “The Fantasy Film Music of George Pal”) was used.